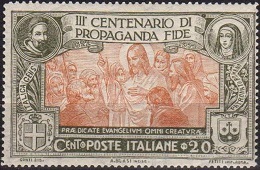 The commemorative stamps of Italy continued to be issued for important events between 1922 and 1924. But, something a bit "darker" and very ominous was on the horizon. In the United States, the decade was called the "Roaring Twenties". Liquor was banned, but otherwise, life was good! Elsewhere in the World though, life was very different. In the years following the end of World War I, there were devastating social and economic problems throughout Europe. Many of the post-war European governments could not withstand these problems, and in the midst of this environment, extremist political movements began gaining public support. Benito Mussolini became a member of parliament in 1921, and by 1922, his National Fascist Party had 700,000 members. 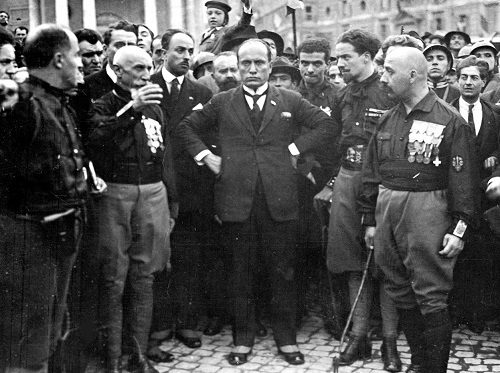 A few days before the March on Rome, Mussolini consulted with the U.S. Ambassador to Italy, asking if the U.S. would object to having Fascist Party participation in a future Italian government. The ambassador told him to proceed. Between October 22 and October 29, 1922, some 30,000 members of the Fascist Party marched on Rome. On October 28, 1922, King Victor Emmanuel III appointed Benito Mussolini to the position of Prime Minister and handed over control of the government to him. Less than 20 months later, Mussolini would become the Dictator of Italy. One of the more noble projects of Mussolini was his effort to restore the glory and the prestige of the Ancient Roman Empire to modern Italy. In these efforts, he sponsored new archeological projects, the restoration of the existing monuments of ancient Rome, and the recovery of some important Roman Imperial monuments that had been lost and largely forgotten for hundreds of years. 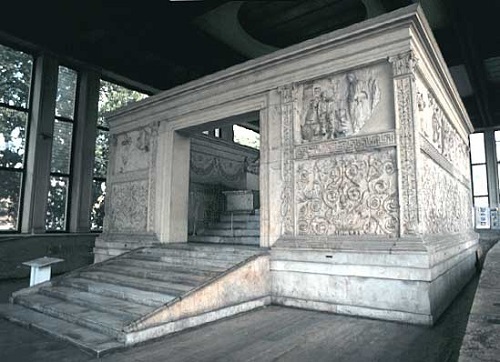 One of the forgotten treasures of Ancient Rome was the Ara Pacis (Altar of Peace) of Caesar Augustus, constructed between 13 B.C. and 9 B.C. to honor Augustus' victories in Hispania and Gaul. Over the centuries, the altar eventually became buried in about 16 feet of silt near the Tiber River. It was re-discovered and re-assembled. The effort included recovering portions of the carved reliefs from the altar, which had been dispersed to various museums around the world over the centuries. The altar was then re-located to a nearby glass enclosure in 1937, where it remains to this day. Over the period between 1922 and 1938, there were also many sets of Italian commemorative stamps issued to honor the glory of the Ancient Roman Empire, and these philatelic works-of-art are eagerly sought by stamp collectors Worldwide. 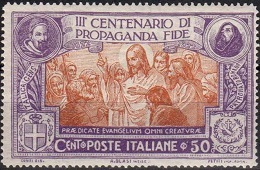 Postally used examples of commemorative Italian stamps, from the beginning, through the 1930's, are scarce, and many of them are tremendously expensive. The used prices in the catalogs are for postally used examples. Stamps with favor cancellations or forged cancellations are worth the same price as lightly-hinged mint condition stamps. Many of the high-priced commemorative overprints have been forged. Be very careful, when buying any overprinted stamps that do not have certificates of authenticity. These three stamps of Italy (Sc. #140-42) were issued on September 20, 1922 to commemorate the 50th Anniversary of the Death of Giuseppe Mazzini. The designs feature the Flame of Patriotism Tempering the Sword of Justice, a portrait of Mazzini, and Mazzini's Mausoleum in Genoa. Giuseppe Mazzini (1805-1872) was an Italian politician, journalist, and an activist for the unification of Italy. He is revered, along with King Victor Emmanuel II and Giuseppe Garibaldi, as one of the founding fathers of the Kingdom of Italy. His funeral in 1872 was attended by 100,000 mourners. Mazzini was also an early advocate for a "United States of Europe", about a hundred years before the European Union began to emerge. He viewed European unification as a logical continuation of the Italian unification. The four overprinted definitive stamps of Italy shown above (Sc. #142A-42D) were issued on June 4, 1922. They are a philatelic issue promoting the 9th Italian Philatelic Congress, held in Trieste. Only 15,000 sets were printed. They were only sold at the central post office in Trieste, between June 4 and June 10, 1922, and they were no longer valid for postage after November 30, 1922. Authenticated sets are scarce and very expensive. The attractive set of four stamps shown above (Sc. 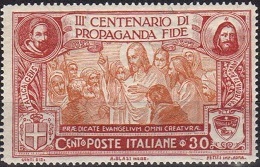 #143-46) was issued on June 11, 1923 to commemorate the 300th Anniversary of the Propagation of the Faith. 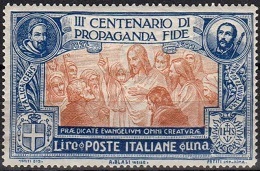 The central vignette of each stamp depicts Christ Preaching the Gospel. A portrait of Pope Gregory XV is in the upper left corner, with the Arms of the House of Savoy in the lower left corner. The portrait in the upper right corner and the shield in the lower right corner is different for each of the denominations. Pope Gregory XV (1554-1623) created the Congregation for the Propagation of the Faith on January 6, 1622, as the missionary arm of the Holy See. Almost this entire issue was bought up by speculators. Mint sets are common, whereas authentic used sets are extraordinarily expensive. The six stamps of Italy shown above (Sc. #159-64) were issued on October 24, 1923 to celebrate the 1st Anniversary of the March on Rome by the National Fascist Party. The designs feature allegorical representations of the fascist government of Italy. The six stamps of Italy shown above (Sc. #165-70) were issued on December 29, 1923 to commemorate the 50th Anniversary of the Death of Alessandro Manzoni. 10 C. - Fishing scene. 15 C. - Mt. Resegone. 30 C. - Fugitives bidding farewell. 50 C. - Lake Como. 1 L. - Manzoni's home in Milan. 5 L. - Portrait of Manzoni. Alessandro Manzoni (1785-1873) was an Italian poet and novelist. He is most famous for his novel, The Betrothed, which ranks among the masterpieces of World literature. The first four stamps in the set shown above illustrate events from this novel. The novel is also a symbol of the Italian unification for its patriotic message. In February 1924, the Victory on the Piave commemorative stamps of 1921 were all re-valued for use as 1 L. postage stamps. They are all shown above (Sc. #171-74). These stamps come both perforated 14 and perforated 14 x 13 1/2. The two perforation varieties are worth about the same. On February 16, 1924, the seven definitive postage stamps of Italy shown above (Sc. #174A-74G) were all overprinted with CROCIERA / ITALIANA / 1924. These stamps were sold on-board an Italian warship traveling to South American ports during 1924.